Their friendly family and staff are here to invite you to be a part of their wonderful atmosphere. Wear your swimsuit or tan all over on our naturist friendly and family friendly beach. Step out of your cottage, apartment or penthouse suite into a lush idyllic beachfront garden and surround yourself with exotic tropical flowers, fruit trees and hummingbirds. The quaint, ocean-front property places you directly on Negril's famous white sand 7 mile beach, where you can enjoy the soothing, crystal clear, turquoise Caribbean Sea which is safe for swimmers and non-swimmers, children and adults. Firefly is the only small Negril Hotel for couples, children and singles that offers swimsuit and naturist beach experience. Our friendly family and staff are here to invite you to be a part of our wonderful atmosphere. Wear your swimsuit or tan all over on our naturist friendly and family friendly beach. Step out of your cottage, apartment or penthouse suite into a lush idyllic beachfront garden and surround yourself with exotic tropical flowers, fruit trees and hummingbirds. Our quaint, ocean-front property places you directly on Negril's famous white sand 7 mile beach, where you can enjoy the soothing, crystal clear, turquoise Caribbean Sea which is safe for swimmers and non-swimmers, children and adults. Enjoy a cool tropical drink at the Firefly Beach bar and view a beautiful Caribbean sunset. Experience the genuine warmth and hospitality that only Jamaica has to offer at our free weekly beach party with music, drinks, winter bonfire and surprises! Do not miss the relaxation or fun in our Jacuzzi in the moonlight each balmy evening. 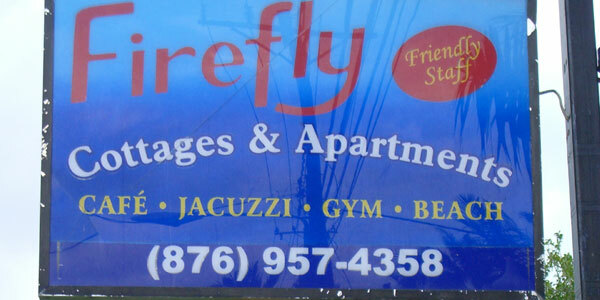 Surely, Firefly is one of the most relaxing and romantic places in the Caribbean.